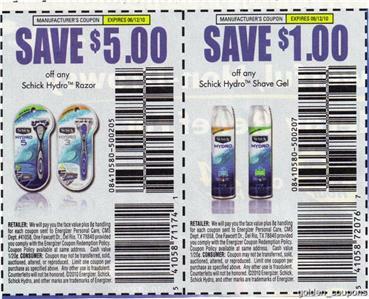 There are (4) $5.00/1 Schick Hydro razor AND (4) $1.00/1 Schick Hydro shaving cream coupons up for grab! 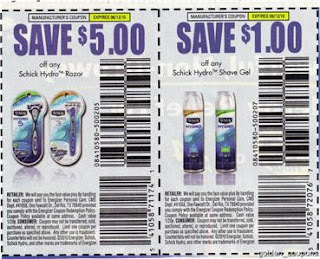 These can make for FREE or very cheap razors and shave cream! 2. You can get a second entry by subscribing to Centsible Savings by email, in a reader, or on facebook. Leave a comment stating that you are subscribing for the first time. For FIRST TIME SUBSCRIBERS/FACEBOOK FRIENDS ONLY! Would love to win since I was only able to get one paper that week, and already used the $5 coupon! Wow! Thanks for offering this! Thank you for all these great offers. Winning would make my day!! I did not get these coupons in my Sunday paper. i wanna win these coupons! i need to shave!!! i would appreciate these coupons! Thanks for the opportunity. One of these days I will win one of the giveaways! Have a great evening!